My sister used to live in a town that didn't require smog, but she wouldn't let me use her address. Now, smog isn't really my problem. I put on the cat and it passes fine. My issue is passing visual, at any other time. If an LEO decided to look under my car, right now, and see no cat, I'm busted, no matter where my car is registered. The car still has to meet smog requirements. Or so I'm told. Just weld a heatshield onto your test pipe, I passed visual with it because I couldn't find an OEM for sale haha. Edit: I need to read *all* the new replies before responding, seems a few others said the same thing lol. That will work for the uneducated. My smog guy reads the serial or part number on the cat (so he says). He gets on his knees and checks the entire car with a flashlight. I definitely ain't passing visual with it. Try to look for another shop if you can. It's a fine balance between someone not so incompetent they'll fail you because the Evo never came from the factory with a turbo(this actually happened to me) and someone who actually cares about their job. Look for reviews where people talk about how quick smog was. In and out is what you want. Luckily the guy that passed me was an older dude who happened to he a Lancer enthusiast. Total stroke of luck, hopefully you can find someone who's a bit more lenient. I had a smog shop tell me the silver OEM intercooler pipes were aftermarket. Dude literally wagged a finger in my face. So then I upgraded to black aftermarket intercooler pipes and passed visual inspection. Would have been pointless to remind them that intercooler pipes aren't even restricted by CARB. Things really do get this stupid. Since then I passed legit with a different shop 3 times in a row, although the first time it took several hours convincing him that the Evo 9 does in fact exist. No, Mitsubishi did not go from 8 to 10 like his book says they did. Also here's one of the funniest photos I've ever seen. 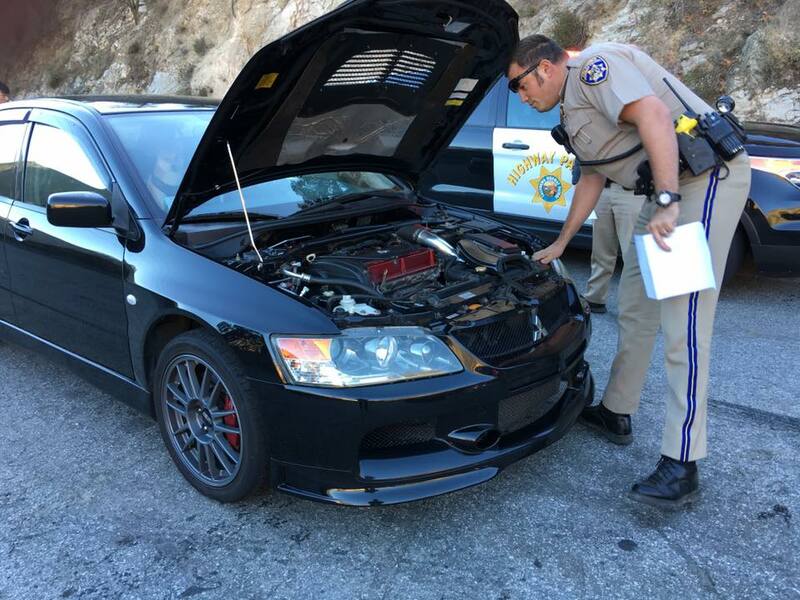 It's the last 100% stock Evo in California being inspected by a rocket surgeon. The confused dog in the window, the whole thing is a complete joke. Last edited by Name User; Mar 22, 2019 at 12:20 AM. My guy hassles me the least. The BAR has smog shops in my area so scared, they don't even want to do my car. I have to show them the hood sticker that shows the turbo/accessory routing, I've had to use Google to show my intercooler pipes are stock. I once took a salvaged Evo to get a brake and lamp inspection done. I could not convince the shop my tail lights were stock. x2, you can def find someone a bit more lenient. As soon as I pulled up to my guy, all I said was " I already checked all the readiness monitors at work & they all pass " & he didnt even look he just plugged it in. The good news about this is you can claim ignorance and just explain that the smell is because "you believe" the cat is going bad and needs replacement soon. This way it doesn;t look like you did it on purpose lol. That guy deserves to be punched in the face. I probably would have shown him OEM pictures of the car parts to his face immediately and refused to leave until he was educated. Someone that stupid doesn't deserve to be in that department. Likely a waste of time trying to explain away any non compliant issues to the Cop. They're not going to be getting on all 4's to check your CAT / TP. Last edited by MinusPrevious; Mar 23, 2019 at 08:34 AM. Likely a waste of time trying to explain away any non compliant issues to the Cop. Their not going to be getting on all 4's to check your CAT / TP. That annoys the **** out of me. My nearest ref is 2 hours away so on a whim an officer can just waste 6 hours of my life because he doesn't know any better. Luckily I've never had any police question my modifications, but I'm just waiting for the day an overzealous chippie decides my stock-looking Evo is a Fast and Furious drift car. That is damned near an exact quote from a local CHP officer I spoke to. They aren't required to know why they are writing you up. They just throw **** at the wall and see what sticks.